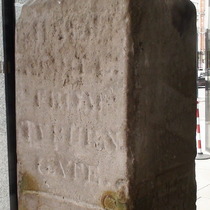 This stone, which originally stood opposite the present junction of Star Street and Edgware Road, after having been preserved for twenty five years by the Consolidated London Properties Limited, was presented by Mr J. H. Podmore on their behalf to the London County Council who, with the consent of the Capital and Counties Bank Limited, re-erected it in the present position in March 1909. The stone is half a mile from the south end of Edgware Road where, at the junction of that road with Oxford Street and Bayswater Road, Tyburn Turnpike House with three gates, stood from about 1760 to 1829. Tyburn permanent triangular gallows stood from 1571 to 1759 in the position afterwards occupied by the toll house. Tyburn was used as a place of execution from time immemorial until 1783. The frist recorded execution took place in 1196. We could not read most of the inscription on the stone but found it at San Francisco Call, Volume 105, Number 173, 22 May 1909 at cdnc. Here we also learn that a brass tablet was affixed to the lower half of the stone but this has not survived. Brought to our attention by IanVisits, this old way-marker is inside the entrance to the hotel. Despite the plaque being modern, the first paragraph of the text is very confusing and just doesn't describe the current situation. We believe it was transcribed without thinking from the brass plaque that was affixed to the stone in 1909. 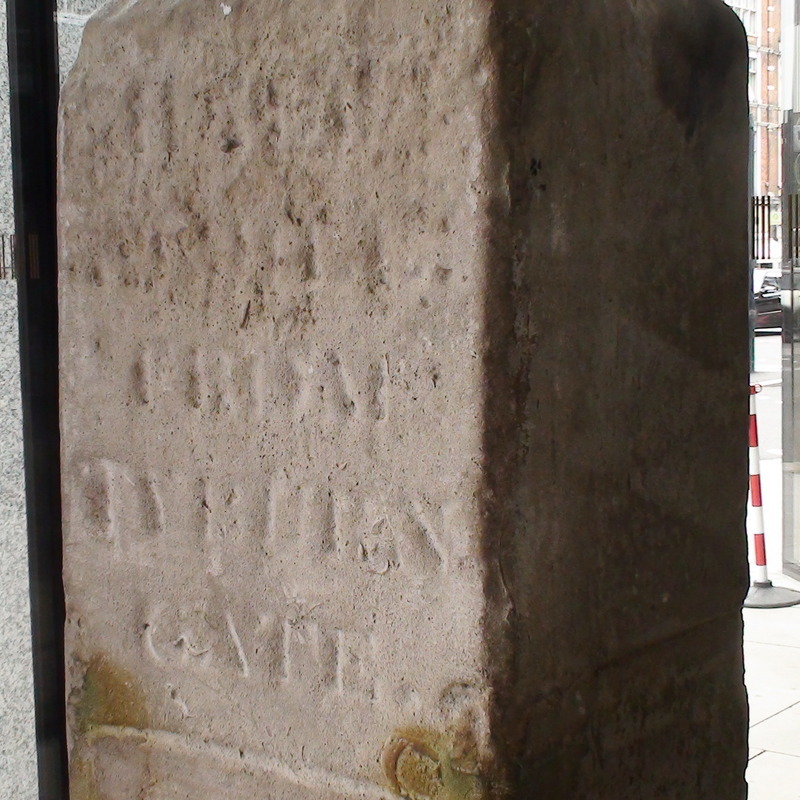 It would have been erected sometime during the life of the Tyburn gate, 1760-1829. It probably remained in place even after the toll-house itself had been removed. Then in about 1886 Consolidated London Properties Limited removed the stone, almost certainly to enable a development on the site, possible the extension of a building over the ground on which the stone stood. They stored it until 1909 when that building was again developed (extended or possibly totally rebuilt) to be the Capital and Counties Bank at number 195 (on the south corner of Star Street). At this point CLP (who were probably the developers of the site) offloaded the stone onto the LCC who displayed it just outside the bank, so it was back in its original location, near enough. Sometime around 1930 the block with the bank is demolished (and replaced with Cambridge Court.) The whereabouts of the stone is then unknown until about 1990 when the hotel is constructed and the stone is re-erected in its entrance. This places it at some distance from its proper home but perhaps it's as close as could be arranged. Additional fact: Capital & Counties Bank only existed with that name between 1878 and 1918 when it was taken over by Lloyds.